As Guides, we are not on the earth’s plane and We can see the “Bigger Picture” of the Soul’s journey. It is possible for you to learn through numerous Universal Spirit Laws to also see some of the “Bigger Picture” as it concerns you. Let Us illustrate with the term “Universal Spirit Laws”. Here some people will focus on the word laws. Their laws must be obeyed or else! By fixating on obeying the laws, or else, you might miss the more important understanding that it is the Spirit in which the laws are done, which is more important than the laws being obeyed. If the Spirit is one of love then the laws are all easy to implement. In many religions traditions have evolved and become laws. If the Spirit in which these traditions are undertaken is one of love then they are willingly done. If, as may be the case, that social peer pressure and fear of rejection by the community is the motivation behind the undertaking of the tradition then the law is being implemented but not the Spirit of the law. In the Law of Reflection, by looking for the mirror of what is being reflected back to you by other people and things you can start to look past the obvious and transcend to begin to see the “Bigger Picture”. 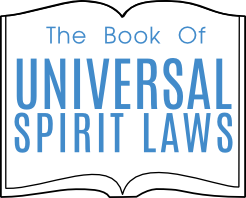 To help you transcend, We recommend you look at other Universal Spiritual Laws and find how your desire to gain transcendence to see the “bigger picture” can be propelled by implementing the Spirit of certain of these laws. In the Spirit of your journey of self discovery may these laws help you transcend to greater enlightenment.